National Institute for Health Research shows interest in Early Lab. NSFT's colleagues at CLARHC in Cambridge show interest in the design approach and outcomes of Early Lab's first project with NSFT seeking a potential collaboration and invite us to participate in a one day research conference. 24 June 2016. Regional health research institute seeks potential collaboration with Early Lab. 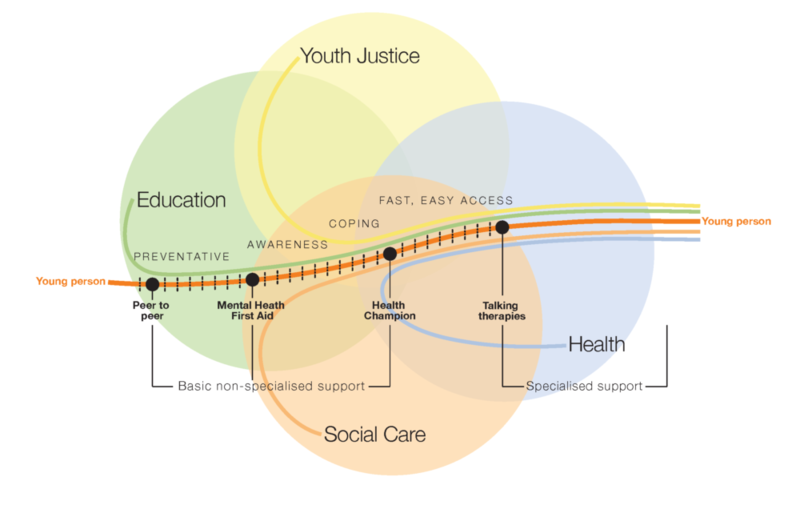 Preventative integrated care pathway. Page from Early Lab Research Findings Document presented to NSFT in Norwich, July 2015. A meeting our NSFT partners have had with colleagues in youth mental health research affiliated with the University of Cambridge has sparked interest in Early Lab’s work. This interest has come from the East of England branch of CLAHRC (Collaboration for Leadership in Applied Health Research and Care) at NIHR (the National Institute for Health Research) in Cambridge. A senior research associate there is interested to explore the overlaps she thinks might exist between their work and our’s. They requested a copy of our Research Findings Document presented to NSFT in Norwich in July 2015 that contained the results of our first project with NSFT. In return CLAHRC shared with us a copy of their ongoing research being done in conjunction with NSFT. This exchange had led to an invitation by CLAHRC for Early Lab to participate in a conference event scheduled for the autumn of 2016 that will ‘focus on bringing education, health, local authority and other partners together to share ideas across the region with respect to the role and work of schools in the mental health response’. The day will be ‘comprised of a mixture of plenaries and interactive workshops that will be facilitated by groups of individuals spanning area and sector’. Early Lab work has been shared with the organisers of this event and we have been asked to plan and run a workshop for it. A CLAHRC representative has said they ‘think this could be a very productive collaboration and a way to bring to life the ideas/changes we want to take forward together’. That such a respected national health research institute should want to devote attention to the design work of Early Lab and see us as potential project collaborators is extremely encouraging and felt as a vote of confidence for our work in the field of youth mental health. Early Lab have planning meetings to look forward to with both CLAHRC researchers and NSFT clinicians in early September.